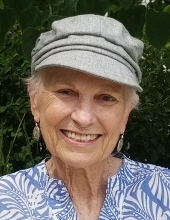 Lake Forest resident since 1981, Carrol died peacefully at home on April 10, 2019. Carrol was born December 24th, 1939 in Syracuse, NY, where her father owned and ran a material handling company – Morse Manufacturing. Upon graduation from St. Lawrence University, a passion for travel led to her Chicago-based job as a stewardess for United Airlines. A few years later, Carrol married Don Smith and began her career at home raising a family. Since 1966, she cherished time at the family vacation home at Lake Skegemog in Northern Michigan. In 1996, Carrol married Jim Herber and moved to the cottage on Hathaway Circle they both adored. They traveled the world and touched many countries and continents, with a desire to learn and appreciate cultures, history, and nature. She was an active member of the Presbyterian church, serving as an elder and deacon, heading the annual rummage sale security team, knitting prayer shawls, and expressing her love of music through bells and choir. Her favorite time was whenever family and friends were near. Her positive, upbeat energy was contagious – she showed us how to celebrate life and live gracefully with cancer. Carrol is preceded in death by her husband Jim in 2013 and survived by her children – Amy McJoynt (T. Kevin), Brad (Meeta Yadava), her brother Bob Andrews (Alice), her grandchildren Tom, Charlie, Matthew, Henry, and Ellie and her nephews and their families. A service in Carrol’s memory will be held on Saturday, May 11th at 1 p.m. at the First Presbyterian Church of Lake Forest, 700 Sheridan Road, Lake Forest. A reception hosted by her PEO chapter will follow immediately after. Info.at Wenban Funeral Home (847) 234-0022 or www.wenbanfh.com. Burial Private, in lieu of flowers, contributions can be made to PEO Chapter MQ IL Scholarship Fund with the notation “in memory of Carrol Herber” - PEO Chapter MQ, 908 Gloucester Crossing, Lake Forest, IL 60045 or First Presbyterian Church Music Fund, First Presbyterian Church of Lake Forest, 700 N. Sheridan Road, Lake Forest, IL 60045. To plant a tree in memory of Carrol A. Herber, please visit our Tribute Store. "Email Address" would like to share the life celebration of Carrol A. Herber. Click on the "link" to go to share a favorite memory or leave a condolence message for the family.